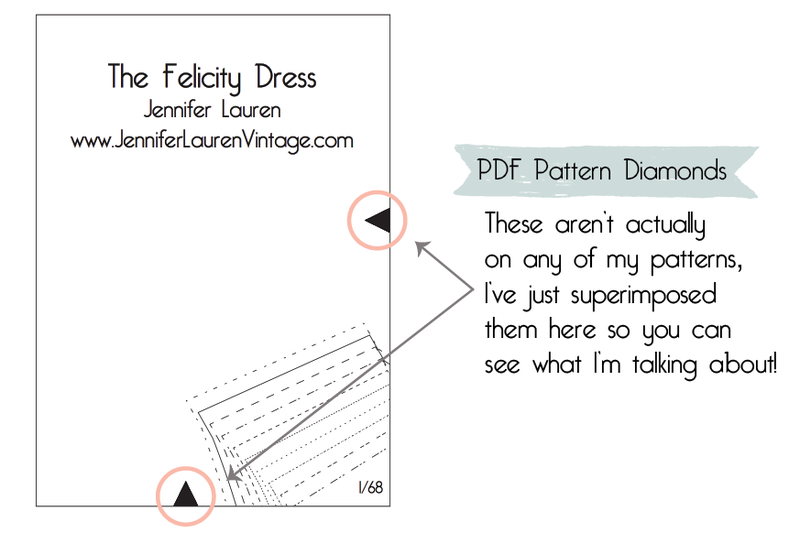 If you've bought one of my pdf patterns, you probably would have noticed that I don't put those little diamonds up the sides of the borders that most pdf patterns have. They are sometimes put there to help you match your pages together as you're assembling your paper pattern. Some patterns have diamonds or squares, some have circles in the corners, what ever they use, I don't have anything like that. I've had people ask me or comment about this in the past, never in a bad way, just in more of a surprised way, because out of habit and experience they expect them to be there. My question though is always are they actually useful? The reason I don't use these extra pattern markers is because I don't believe they need to be there for my patterns - I don't think they are useful or make assembling my pdf patterns easier or faster. In fact, I think they would add an unnecessary layer of complexity to pdf's (which people already find a little draining on the soul to print out and piece together in the first place) that just complicates the whole process. In my book, you need two main things to accurately assemble a pdf pattern - borders and the pattern lines themselves (as well as some way to ensure your pattern pieces are up the right way. I also provide a visual and numbered layout of each pattern piece in the instructions which shows you how to lay everything out). The borders around each page ensure that you are cutting out the pattern to the correct size. Then, matching them together (along the side, top and bottom) ensures that you are taping your pages together exactly parallel, as opposed to slightly skewed - which would then result in a slightly off pattern piece. The pattern markings themselves then become your next check point in making sure your pattern is going together accurately. Once the borders have been lined up, the pattern markings should flow between the borders from one page to the next, joining up at all sizes or forming pattern piece information etc as you tape. And that's it. I don't think you need to add an extra step to the process by also trying to line up diamonds. And to be fair, if you're accurately lining up your borders and pattern lines (which are the most important), then your diamonds (or circles!) would line up anyway. The only reason your pattern wouldn't be lining up is if you hadn't printed it to the correct scale, or the pattern wasn't exported into a pdf format accurately before you even got your hands on it. I think it's good to question why things are done they way they are - sometimes it's for a very good reason, but other times, not so much. So, I'm really curious to hear your thoughts on pdf pattern diamonds - do you pay attention to them? Do they actually help you to assemble patterns? Have I got it totally wrong? Edit: I just thought I'd point you over to my tutorial on putting my PDF Patterns together to give you a bit of background into why I don't use these diamonds on my patterns - start reading from step 4. There is No Reason why you should trim all 4 sides of each piece of paper when taping up your pattern. It's much easier (and faster!) if you cut one side, and leave the corresponding side of the page next to it untrimmed. This way, it's easy to line up AND easy to tape together, since one page sits on top of the other. I also provide a visual and numbered print-layout for each of my patterns (divided into pattern pieces or different views), to ensure it's simple to put together, which is why, for me, adding diamonds seems like a bit of an unnecessary step. Another Edit! There has been some discussion, both here and on Instagram about pdf pattern border thickness. I totally agree this plays a big role! The thinner the border the better - for reference, my borders are thin, they are the same size as the pattern outlines themselves. So, assuming all pdf patterns have thin borders (though I've not used every pdf pattern out there, so I have no idea personally) then I suppose I'm still not sure how having those diamonds on there helps to line things up accurately, because, just like the pattern markings, you can never be sure whether they sit to the inside of the border, the middle or the outside. And, if the borders are the same thickness as the pattern lines themselves, then how do you know where to cut the actual pattern itself? This goes for paper AND digital! I personally aim to cut down the middle of the line, but when they are so thin, it doesn't really matter a huge amount as there will always be some margin of error. That margin of error will increase yet again when you actually cut out your pattern in your fabric. 18 comments on "PDF Pattern 'Diamonds' & My Thoughts"
Interesting. I think you are right. They aren't necessary. I think people expect them though, since almost everyone does it. I'm certainly going to think about my own patterns and see if the extra marks can be left off. I tend to print mine in the corner so there is no trimming. That cuts off one top and side border, so I might still need them. I'm all for saving ink though! Hi Sara - I think some people love them and some people don't really care so much. I guess I'm in the 'not care so much' group, but I've not had any complaints so far that people can't piece a pattern together because they aren't there. I do number my pages like you and provide a visual layout in the instructions, so I think that the pattern could definitely be put together without the matching dots I use. But you are right...not everyone will be happy either way. It's probably best to leave it alone for now. It is good to question why we do what we do though. Is everything really necessary or is it just cluttering up the pattern? Thanks for pushing me to think about it! I like the triangle matching where there are numbers to match. It means I can pick up the right piece straight away. I tend to ignore them even when present. To be honest I generally find they only serve to illustrate the one or two tiles that haven't quite exported properly. For me I'd rather focus on the pattern lines, they are the ones that count! That's what I think too :) In the past, I've never paid attention to them, so I opted to leave them out of my patterns!! I tried to leave them out, too for the same reason. But then I got several testers asking to put them back in, so I did. And that was with borders, with big watermarked numbers on the page, and a layout page. So I put them back in because it wasn't that much work anyway. That's really interesting Lisa. I've only ever had one tester mention it in all of the patterns I've released, and it was more in a curious to know why I didn't have them on there way. It's also been vaguely mentioned in passing, but again, never in a 'they need to be on there' way. So, I'll probably personally continue to leave them off for the time being since I've not had any complaints. Yes it's funny right, maybe if I'd have had different testers, I would not have had any comments on it either. I make them light grey to save ink. But I'd rather use as little extra lines and dots as possible, it only makes it more confusing to discern the pattern pieces. I always just use the corners and pattern pieces to make sure everything is square; diamonds are no in my opinion a girls best friend on patterns. What frustrates me about PDF patterns is that it is never specified whether the border lines need to be cut off or cut around. Border lines are quite thick and those extra millimeters can really influence whether the pattern matches up or not. Hi Amiria, there was actually some discussion about this on instagram too, so I've added in another edit about this issue into this post. Awww, thanks Veronica!! I have my own weird way of exporting my patterns into a PDF - probably not the way it's 'actually' done, but it works for me :) It did take a bit of trial and error though!! 1. 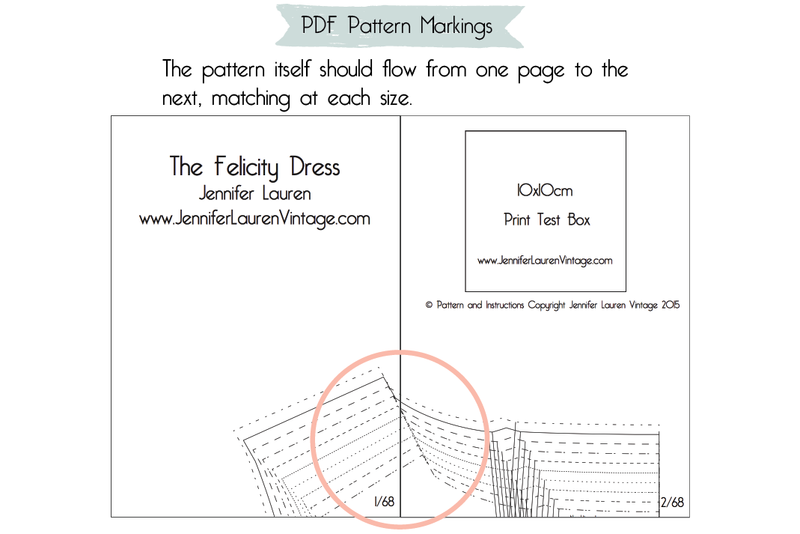 Although you recommend assembling pages exactly parallel, this is difficult to do with precision on pages without any mid-page marks (like in the Felicity skirt). A skewed blank page can cause problems with the entire pattern piece. 2. My strong personal preference is for mid-page marks that also show how a page is matched to the next page. Not only does this give another matching point, it also helps determine how the pages are tiled together without having to look at another screen or printed diagram. I know you provide this, and it's helpful, but I really appreciate being able to look at a piece and attach it to its neighbors without reference to the layout. I'm sorry you found it a bit more difficult to put the pattern together without the markings. I agree that a skewed pattern piece does make the pattern off slightly and do mention that above. Having the borders is what makes sure the pattern piece isn't skewed, as you need to line them up exactly parallel with each other, and having those small diamonds in the middle wouldn't help with that because they don't span the length or width of the page, if that makes sense? You could match your diamonds up in the middle, but if your borders weren't lined up, then your pattern could still be skewed at the top or bottom, which is why I believe the borders are the most crucial. With your second point, I totally see what you mean. I guess, the pdf patterns I've used in the past don't actually label the diamonds, they are simply just there. But having them labelled, I can see why a pattern would piece together faster.